Recently we teamed up with Jenae at I Can Teach My Child to host our "A Very Toddler Olympics" series. We shared ten activities over ten days and today we have four MORE Olympics themed activities to share with you. The Olympics is an easy birthday or playgroup theme. A week or two ago we decided to host our own Backyard Olympics. We created FOUR new Backyard Olympics ideas and today we want to share TWO of our simple and silly activities with you here on Toddler Approved. You can find two MORE of our awesome backyard Olympics ideas over on the Melissa & Doug Blog. 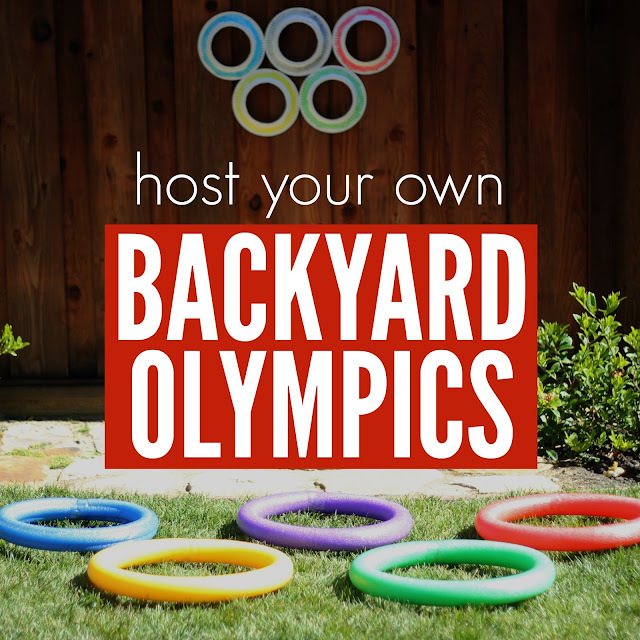 If you want to set up your own Backyard Olympics the first thing you need to do is decide on the events. I picked four events using easy-to-find materials. Then I had my little helpers work with me to set everything up and test things out. 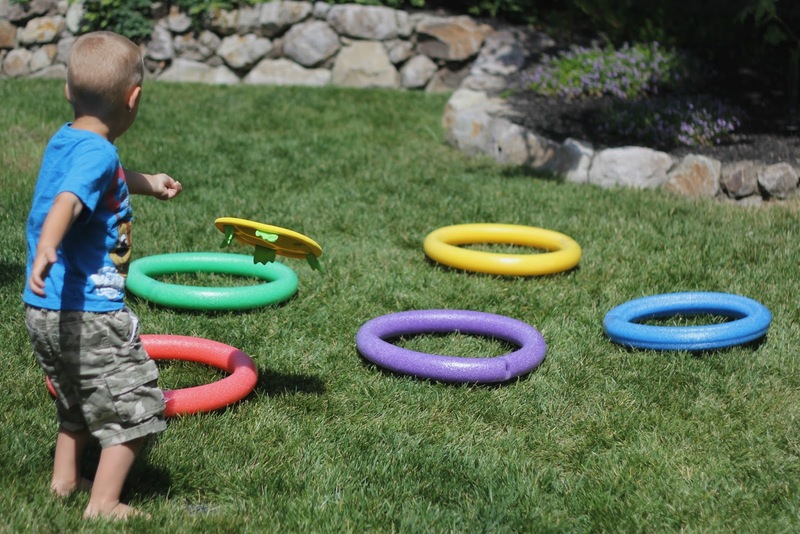 In our Backyard Olympics the kids were encouraged to try each event. The fastest, most enthusiastic, silliest or hard-working kids earned awards. To get started I created large rings using the pool noodles. I made sure to buy Olympic ring colors... and could only find purple, so used that in place of black. I used clear packing tape to secure the ends to one another. Then I arranged the pool noodle rings to look like the Olympic rings. Once the noodles were arranged we got busy playing the game. 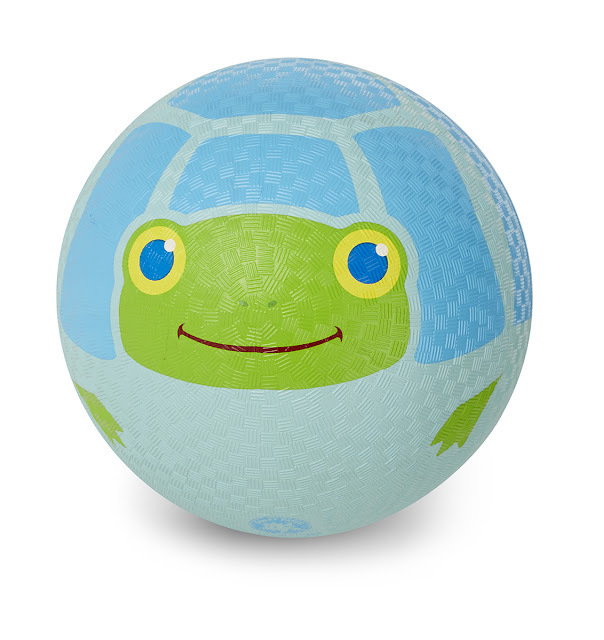 The goal of the Frisbee Toss game is to get the turtle flying disk inside each Olympic ring. This event reminded me a big of discus... especially since the kids threw these disks in all sorts of ways. For little kids who couldn't seem to aim the disk and throw it... we encouraged that they try and drop the disk in each of the colored rings instead of throwing them. As we played this game we talked about colors and practiced saying their names and identifying them. We also talked about the Olympic rings and the colors. 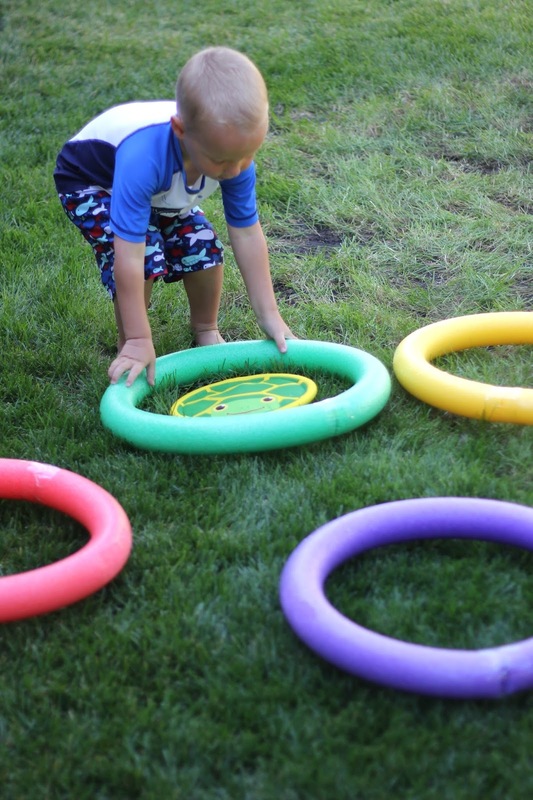 Kids also worked on hand-eye coordination as they aimed the disks into the rings. 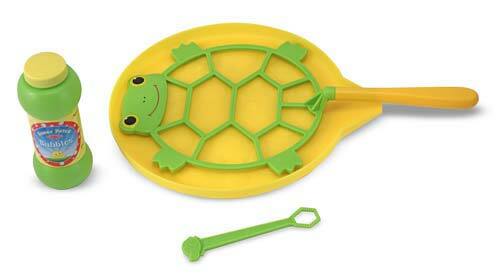 This was a whole body activity and kids loved launching the turtle disk and sending it flying all around our backyard. This Olympic event could not be any easier. 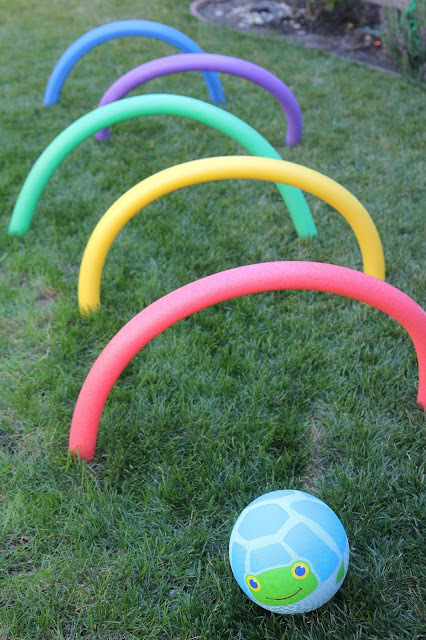 The goal of this game is to carefully roll a ball all the way through the colorful tunnels. Materials Needed: 5 pool noodles in different colors, lawn stakes, and a Dilly Dally Kickball. To set up this game I used lawn stakes and stuck them into the ground (two by two). Then I put the ends of the pool noodles over the lawn stakes to help secure them and create arches (or tunnels) using the pool noodles. I repeated the process until I had five tunnels. Once the tunnels were set up, our little Olympians tried to push or kick or roll the ball or through the tunnels without knocking them down. This simple movement activity helped teach kids about spatial awareness. Kids also worked on picking, pushing, and rolling balls while kind of aiming at a target. 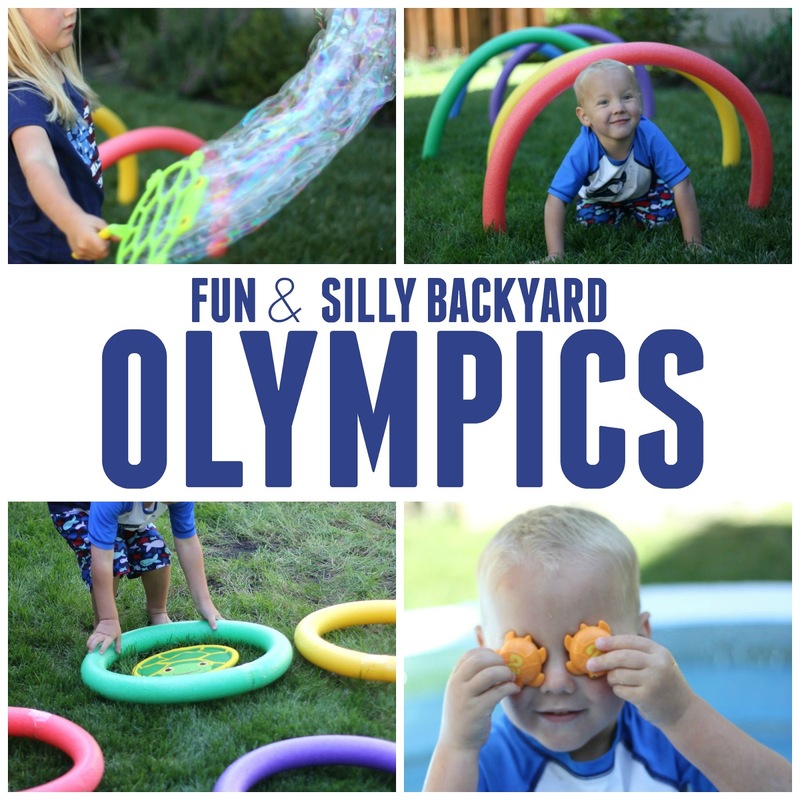 Now make sure to pop on over to the Melissa & Doug Blog to see our two other awesome Backyard Olympics activities that we are sharing today! Below you'll find some of our favorite Melissa & Doug toys that we used during our Backyard Olympics. 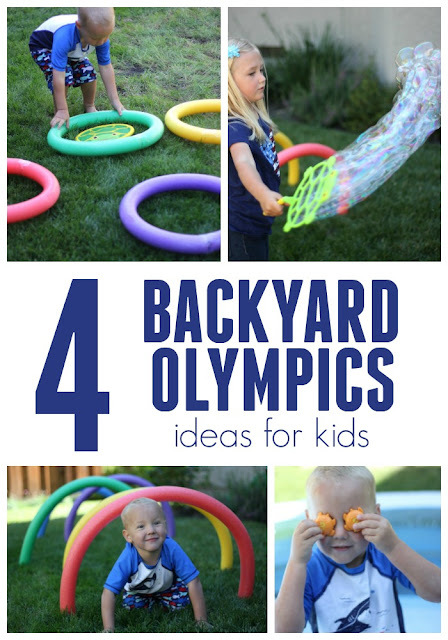 You can find more of our favorite Toddler Olympics ideas on our "A Very Toddler Olympics" series landing page. Disclosure: I am a paid guest blogger over at the Melissa & Doug Blog and received these Melissa & Doug products for free to use as part of our Backyard Olympics posts. All opinions are mine. 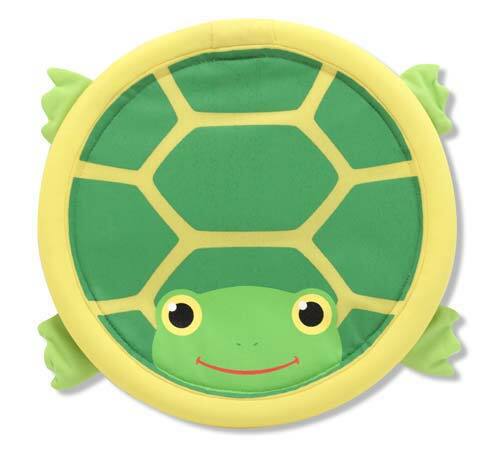 Disclosure: We received the Melissa & Doug products that are featured in this post for free! I am also an occasional paid contributor to the Melissa & Doug blog and I was paid to create the Melissa & Doug post shared over on Playtime Press. The opinions shared in this post are mine.